Takeaway: Advances in engineering and computer science also mean advances in geotechnical investigations. These modern methods are making things easier (and more precise) for trenchless projects. Geotechnical investigations help engineers and project teams understand the conditions of the ground and existing pipework underground. The purpose of this is to properly scope out the project requirements and anticipate any problems. The more accurately the scope can be defined upfront, the less time and costs are wasted during execution. It speeds up decision making and makes the whole project safer and more efficient. Some methods for determining the ground conditions below the surface are based on human actions and measurements. This has the inherent disadvantage of lower accuracy and repeatability because we all do things slightly differently each time we perform the same action. For example, dynamic cone penetration (DCP) measures the thickness and location of soil layers underground. The principle involves dropping a fixed weight onto the push cone, and measuring how far it penetrates the soil with each stroke. Performing this test manually is labor intensive, time consuming and not very accurate. However, combining this method with handheld computing technology radically improves the efficiency of the task and quality of information. Automated systems can drop the weight in a completely identical pattern with each stroke. Electronic measurements are captured on a handheld device and collated into a data set and graph for analysis. Moving from manual to electronic methods allows engineers to focus on value-adding analysis rather than time-consuming data collection and validation. Geographic information systems store, analyze and visualize information in geographic terms, usually in the form of a map. These systems are not only used for trenchless construction purposes, but are widely used in environmental, political and social applications. However, their application for geotechnical investigations is gaining traction as developers create tools that are aimed at this use. A study explored the use of GIS systems to map groundwater potential as an important factor in trenchless project execution. The presence of groundwater along with its depth in the soil and the pressure it exerts plays a role in which trenchless method is selected for the project. It also prepares construction teams for the challenges they will face so they are not caught off guard during the execution. The results of this study showed a map of groundwater potential, which could be used to inform the best route of an underground pipe as well as technical decisions affecting the trenchless construction method. The advent of GPS technology influences everything from car navigation systems to monitoring an important package on route to delivery. Of course, using GPS coordinates for reporting information from geotechnical investigations also offers significant advantages. Many geotechnical devices from GPR to DCP or intelligent pigs come with built-in GPS locating. This is vital so that data from different input sources can be overlaid and reported on the same map. 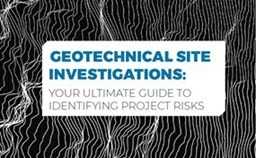 In addition, the information can be stored indefinitely in the cloud, making it possible to refer to today's geotechnical investigations at any time in the future. Not only is the information accessible, but also the exact location in the ground. Ground-penetrating radar (GPR) is a well-known geotechnical investigation technique for identifying underground pipes or utilities. But recent developments in technology are using GPR results to give a more detailed and visual representation of the underground installation. The system is called “cognitive ground penetrating radar” and has two main components. The GPR itself identifies the underground infrastructure by transmitting high frequency radio signals into the ground that bounce back up to a receiver off the pipes and utilities. This information is collected into a series of scans that represent the entire area. The cognitive element comes in by using augmented reality software – most often associated with video games. The software converts the scans into clearly recognizable 3D objects using a smartphone and augmented reality goggles. CCTV cameras have been in use for many years to provide a visual inspection of sewer pipe internals. An analysis of the results informs decisions about flushing pipes that are partially blocked and further inspections when defects are identified. The use of zoom cameras is making this process more efficient. Using a zoom camera attached to a pole at a manhole generates an image of the sewer internals up to 400 feet into the pipe in any direction from the manhole. This means that municipalities can obtain an overview of their system with a simple zoom inspection. They can then use this information to decide where to deploy their CCTV inspections for more information. Using zoom cameras effectively can save municipalities from wasting time and resources on sewer pipes that are in good condition. Technology is advancing in every area of life, engineering and business, and geotechnical investigations are not excluded. Some advances are the result of moving from manual to electronic systems, some involve combining different technologies together and others are just a better use of technology that is already available. One thing that is certain is that technology will continue to advance and trenchless construction is sure to benefit.